Recently, we made our trek to our local library. 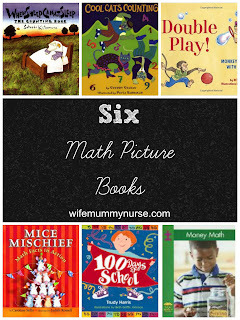 While there, I decided to look for educational math picture books to read to my daughter. Charis was able to easily understand most of the books I borrowed (with the exception of Money Math). When Sheep Cannot Sleep: The Counting Book by Satoshi Kitamura. Woolly, the sheep, could not sleep, so he went for a walk. When Sheep Cannot Sleep is a good introduction to counting, and I love that when people cannot sleep, it's suggested that they "count sheep." But in this book, it's the sheep who cannot sleep. Cool Cats Counting by Sherry Shahan. A good bilingual counting book. Teaches children how to count from 1-10 in English and Spanish. Also teaches children Spanish words for different animals. I'm not a huge fan of the illustrations or the rhyming, but my daughter enjoyed to colorful pictures. Double Play! Monkeying around with Addition by Betsy Franco. "Br-iiing, the bell for recess time!" The kids (monkeys) go out to play. This is a wonderful book about teaching children the concept of doubles, ex. 1 + 1, 2 + 2, 3 + 3, etc. Mice Mischief: Math Facts in Action by Caroline Stills. There are ten mice. Some playing, others working. 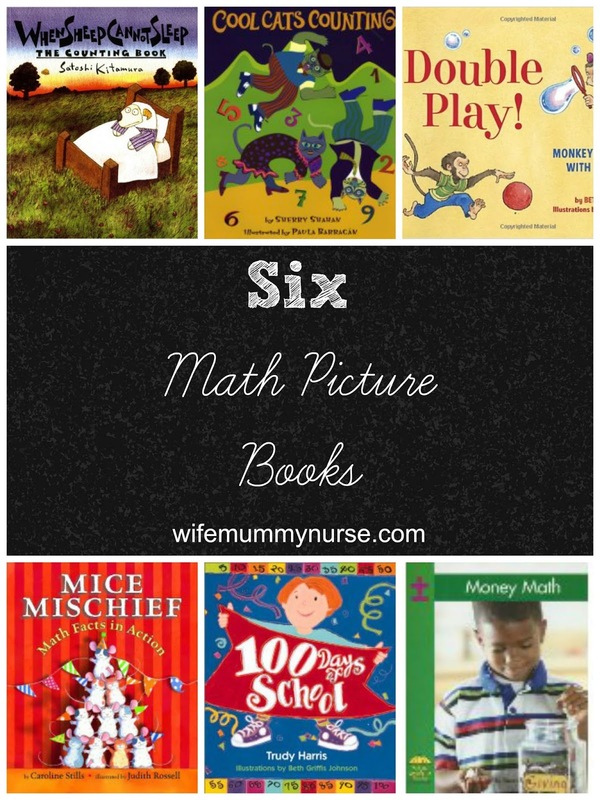 This book illustrates the different ways to add numbers to 10. If your child is learning about addition, check this book out. 100 Days of School by Trudy Harris. "100 Days of School!" This book shows different ways to get to 100 (includes addition and multiplication). Money Math by Susan Ring. Briefly introduces children to various coins-pennies, nickles, dimes, and quarters. It also introduces the concept of addition with different types of coins. Charis had a harder time understanding some of the things in this book. She doesn't understand that one penny is not the same as one dime or one quarter. But I still think it was useful in helping her identify the coins we put in her piggy bank.